I just made this and it was delicious and easy! Made this last night! Turned out great and the best part is it as easy and quick! Great for a week night meal if you get home late like me. We had this for dinner tonight. LOVED IT!! This is incredible! My husband and my picky eaters inhaled it. If you use bacon instead of ham or prosciutto do you need to cook the bacon at all? You can make the one with prosciutto without breeding first, but the zucchini version the crumbs would come off when you smear the zucchini on so I changed it. Just wondering, I have made the zucchini rollatini and this one several times. We love both of them. 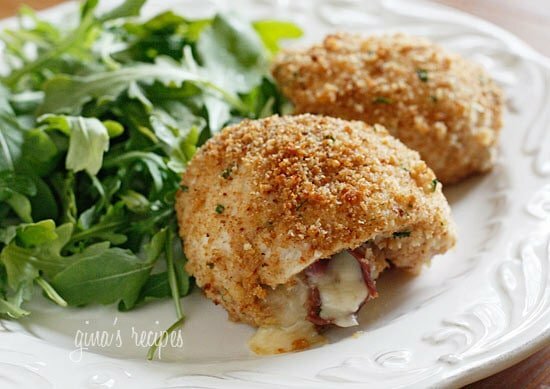 Why in this recipe is the chicken breaded before stuffing and rolling, and the other gets the breading after it is stuffed? Oh and one other thing before i forget… NO ONION!!!! the taste of the onion will overpower the Cheese and the Proscuitto… especially if cooked in a pizziola or Marsala..
And Yes Gina, it is in my opinion, best done in Veal… Pork… I don’t think so, not so much. This was delicious! a huge hit with the whole family! i didnt add the onion, served it with mashed potatoes and green beans, and we will definitely be eating this again! Another quick, easy and delicious recipe!!! Thanks Gina!! I'lll be making this again for sure! I have recently started WW and came across your site. THANK YOU! Love your recipes. This was the first one I cooked and my husband asked me if I was "allowed" to eat this. It makes my life so much easier when my husband will eat what I am. Can you replace your mix of olive oil and lemon with lemon olive oil? It is made with crushed lemon that cures with the olives while they are ripening prior to being made into olive oil. Normally it is very expensive but can be purchase for $5-$6 a bottle at Marshall's or TJ Max. Sometimes I pour some into a zip lock bag with salt and pepper and throw cleaned vegetables (asparagus, green beans, brussel sprouts, etc.) into bag. Squish around then roast in oven spread evenly on a cookie sheet. Love this site. It has motivated me to cook more. I love to cook but was getting bored with all my recipes. I am attaching a frequently requested recipe that is the same concept as all your chicken rolls. 1. Preheat oven to 475 degrees. Grease a baking dish with olive oil pam. In a bowl, mix together the mayonnaise, Dijon mustard, lemon juice, lemon zest, tarragon, salt, and pepper until the mixture is well combined. Set aside. 2. Cook asparagus in the microwave on High until bright green and just tender, 1 to 1 1/2 minutes. Set the asparagus spears aside. Place a chicken breast in a plastic freezer ziplock bag. Firmly pound the chicken breast with the smooth side of a meat mallet to a thickness of about 1/4 inch. Repeat with the rest of the chicken breasts. 3. Place 2 slices of provolone on each chicken breast (leave a small space at top) and top the cheese with evenly divided asparagus spears per breast. Roll the chicken breasts bottom up, around the asparagus and cheese and place seam side down in the greased baking dish. 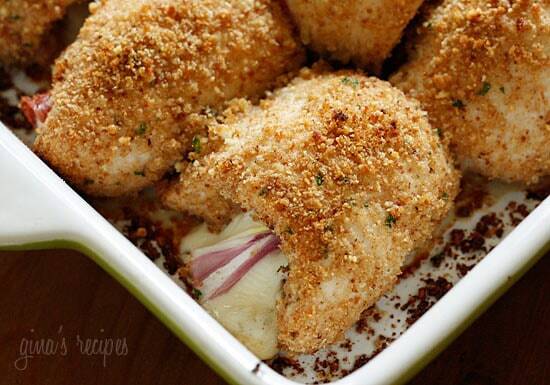 Spoon the mayonnaise mixture on each chicken breast and pour extra into the dish, and sprinkle each with panko crumbs, pressing the crumbs into the chicken to make a coating. 4. 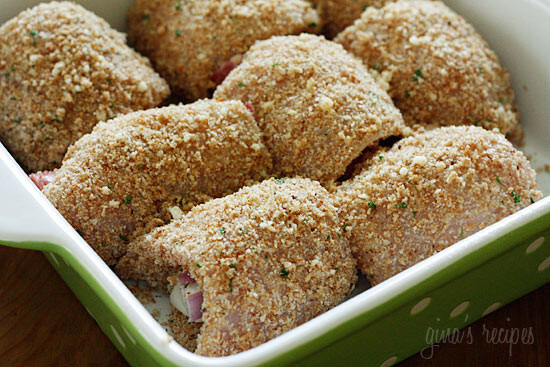 Bake in the preheated oven until the crumbs are browned and the chicken juices run clear, about 35-45 minutes. This is in the oven right now and smells delicious!!!! I used shredded mozzarella cheese and fresh basil leaves in place of the red onion (my hubby is not an onion fan). Can't wait to try it!!!! I made this the other day for my family. Both of my two year old twins ate it and my husband said, "you could make this again!" I made this last night, my boyfriend and I loved them but the only thing about making this dish was that the bottom of all of them burned. I'm assuming it's from the oil of the cheese that spilled out? I cut off the bottom and it was fine. How do I prevent this from burning at the bottom next time? OK! This is the 2nd recipe I've made from skinnytaste.com and I am completely in love with this blog! It was my bf's turn for the Wednesday night dinner rotation, so I suggested he try this. It turned out amazing and all of our dinner friends just thought it was delicious! It was nice and brown, but juicy and tender!! It was cooked to perfection and like you mentioned, went really well with a nice salad! Thanks for such an awesome meal! 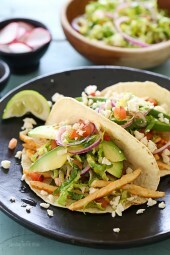 Can't wait for more Wednesday night dinner recipes from ST.
As always another great recipe. THANK YOU! This was fantastic and sooo easy! I put it together while my toddler was napping and then just stuck it in the oven at dinner time. It was so good and I was so proud of myself! Thanks for another great recipe! Lovely, quick and easy! My boys really enjoyed this one, as well as a dinner conversation about other possible stuffings. Thanks for your recipes and inspiration! White bread crumbs or panko would make the carb count the same. Use whatever you can find. Hi! I was just wondering how much worse it is to use panko? I couldn't find whole wheat bread crumbs, but have those on hand. Would that raise the carbs/calories by a lot? I made this last night and it was SO easy and turned out delicious! I might do a whole slice of procuitto next time so it isn't so overpowered by the chicken. Gina, I've been eyeing this recipe for awhile and finally made it tonight – and could kick myself for not making it sooner. 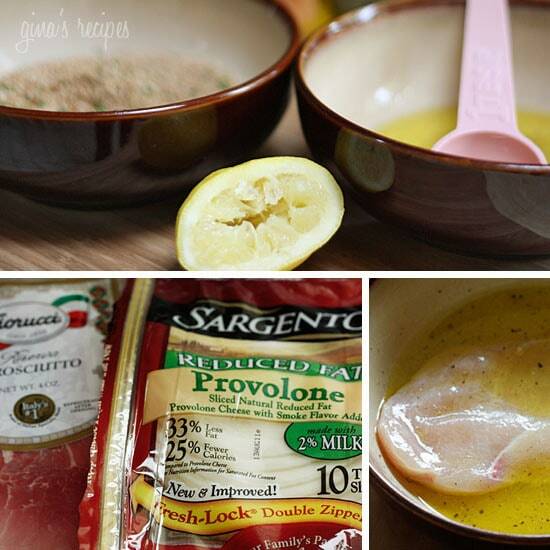 The lemon adds another dimension to the dish – both my husband and I loved it! It's going to be one of my "go to" recipes. 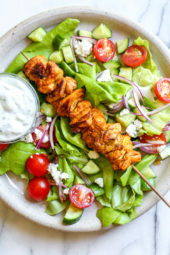 Thanks again for your wonderful blog – you make losing weight painless – I'm down 20 pounds – and not even strictly following WW – just cooking your recipes! This is a great recipe as written. But I really love the technique. It's very adaptable. Last night I made a filling of ricotta, basil and finely chopped sundried tomatoes. Delicious. When my kids go back for seconds I know its good. Thank you so much. Made this last night for dinner. YUM! My husband like it too. I didn't have lemon so I used lime and it worked well. 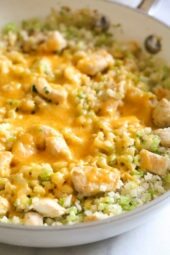 I'm new to your site and am planning on trying many more of your recipes. love the chicken rollatini. altered the recipe omitted onion. added a basil leaf,and a little minced garlic Yum!!!! U need to get a cookbook going. Fantastic as always. Left out tbe onion and used smoked ham instead. I have just found this webiste and cooked this last week and it was AMAZING!!! Will definitley be trying more. Absolutely LOVED these and will definitely make them again. So make flavor and so quick – which is awesome! Everyone loved it. Another delicious hit in my house tonight!!! That's odd! Did you spray them with olive oil spray before baking them? That helps crisp them up. Just tried the recipe and I love it but for some odd reason my breadcrumbs did not turn brown but it was wonderful..thanks!! I made this for dinner tonight and we have NO leftovers! It was delicious! Hard to believe it's only 4 points for that much amazing flavor, love it! I agree, it's very subtle but give the chicken a fresh taste. I made this tonight and it was delicious and didn't taste like a 'light' dish at all. My husband generally hates lemon in or on anything and didn't even comment about the lemon – I noticed it, and enjoyed the flavor but for those that don't like lemon, it didn't distract from the flavor and enjoyment of the dish. This was my first Skinnytaste recipe and I'm glad I've planned my whole menu this week around Gina's recipes! Yes, very moist!! I'm making this again tonight, adding some bell pepper inside. The chicken is sooo moist. No sauce is needed at all! These are amazing! I made a BBQ version by using low fat cheddar cheese and turkey bacon in the rollup with a little BBQ sauce…heavenly! YUM..made these last night and they were really good. My husband even liked them! I used shallots instead of the onion. Really, really good, thanks Gina. lol, Kat you're funny! But I agree, these are so good and EASY!!! I asked a few weeks ago if I needed to pound out the chicken first. I made this the following day, and followed your recipe exactly. Oh. My. Goodness. Never has my entire family(husband, son, mother in law, and father in law) all loved something I made! I was told that this was some pretty freakin' awesome chicken and that if I cooked like that more often, I could cook all the time. While I have no desire to have to be the solo cook in the house, it was fantastic! I even learned how to mince garlic to make the garlic cheddar biscuits to go with it! I will, however, NEVER make onion rings from scratch again. I am, quite honestly, a catastrophe in the kitchen. The onion rings may have tasted decent, but I started to get rather frustrated, to the point of throwing them on the baking pan. Did I premise this with "I am a catastrophe in the kitchen"? This is going to be filed in my cookbook binder under "Kat-proof". That means I was able to make it, AND it tasted fantastic! Jen email me, I always calculate my chicken with cooked weight because that is how my nutritional info is listed. Chicken weighs less when cooked so 4 oz raw is generally 3 oz cooked. Wow Wow Wow Wow!!! What an incredibly good recipe!!!! Both myself and my boyfriend loved it!!! It was so incredibly easy to make and you can taste every single flavor thats added to this recipe from the lemon to the parm cheese. So delicious thank you Gina!!! My calories are for 13 1/3 oz so divided 4 is about 3.325 oz so that would make it about 83.25 calories for each breast. The calories are posted for one piece of chicken, 8 servings. Each cutlet 3 oz. Are you calculating based on 2 pieces of chicken? Hi Gina – I made 4 servings and I calculated chicken based on raw weight. Below are my calculations. Hi Jen, I just recalculated and came up with exactly the same calories as before, 169 each. Are you calculating for 8 servings? I don't know what you are using to check calories, but my guess is either you are using different ingredients or maybe your calculating the chicken based on raw weigh rather than cooked weight. Made this tonight and it was yummy!!! However, I came up with 224 calories instead of your 168…HELP?!?! This recipe is AMAZING!!!! The onion in the middle is like the perfect surprise! had this for dinner last night and it was a winner. thumbs up both from me and my husband. thanks! Another great one! My husband couldn't believe it was still in his points. I didn't think I would be full with 2 but I almost couldn't breathe. That's a good thing! I might try with bacon next time. But it's hard to fix something that isn't broken! This was wonderful! I love the subtle lemon flavor and the taste of the prosciutto and provolone. I'm definitely making extra next time, so I will have some leftovers. Made these for dinner last night…we used ham instead of proscuitto…and they were delicious so tasty and filling!!! There's nothing better than lightened up Italian! Isn't it great! I fell like you can make this so many ways and it will still be great! Another great recipe, Gina. We had some fresh basil that needed to be used up so we substituted that for the red onion and used mozz instead of provolone. This was a big hit. Excited to try it with the provolone and red onion next time! Mary, I think prepping and freezing is a great idea. Gwyn, nice butcher! I think pounding created more surface area which would require more crumbs. Delicious! Couldn't find cutlets & when I asked the butcher he offered to (and did) open up a package of chicken & make them cutlets – he even tenderized them a little by hand. Only difference was that I used diced (large) red onions just so it would cook a little more (personal preference). also I ended up needing a little more breadcrumbs/parm mixture. Kid-approved as well! I make this last night and today I handed everyone at work the recipe. It was AMAZING! Do you think it would be OK to prep this and freeze each roll. Then you can take the frozen rolls out to bake? That is what I do with Chicken cordon blue, but was not sure how the onion would freeze. No I didn't, it's just an added step and not needed. You may need to bake a little less time if you do so it doesn't get too dry. I noticed you did not pound the chicken flatter. By doing this, would I be altering the recipe in a bad way? Not sure, soooo clumsy in the kitchen. Just finished this – WOW – there is going to be a fight for the leftovers. Thanks for another great recipe Gina! Made this last night…LOVED IT!!! They sell thin cutlets in the supermarket, or you can cut them yourself, whichever is easier for you! Neither can I, my husband would love basil in here! oh. my. goodness. This was AMAZING! The only thing I changed (I can never leave well enough alone!) was to replace the onion with fresh basil leaves. It was moist and delicious – like something I would expect from a restaurant! My kids loved it, too. I also used pounded chicken breast (which I then cut in half) as I didn't have any tenderloins and it worked beautifully. I am so glad to have found your site – I have a crock pot with carnitas in it going right now! Monica, the cheese totaled to 2.6 oz in this recipe. Hi Gina. I'm having trouble finding sliced RF mozzarella and I'm not a big fan of provolone. If I was to use the polly-o or sargento rf block of mozz. how much would I use? I may even try using shredded but again, I don't know how much to use. 4 oz. maybe??? Gina! When are you publishing your cook book? This is another winning recipe. I made it exactly as the recipe called for (only my pack of thin chicken breasts only had 5 in it, so I sliced 3 of them in half, vertically which was a perfect serving size for my 4 year old son (who, mind you, gobbled it up without a squawk!) and I left out the onion. Perfect, easy, quick! Another great week night meal to put in rotation! I see that you use whole wheat bread crumbs in many of your recipes but I can't seem to find them. Where do you find them? Or do you make your own? I can't wait to try this over the weekend even if I have to use regular breadcrumbs. I hope I don't forget to answer anyone. Yes, you can make this the day before then bake it when you are ready. It comes together pretty quickly. Bacon I'm sure was great! I'll try that soon! I'm not sure how it effects the points. The pepper is fresh black pepper. Optional of course. The red onion does still have a little crunch to it. It's fabulous if you like onions. If you make this with pasta or a heavy dish, then one is a perfect serving size. My husband decided to eat low carb so we had it with salad and it was perfect. Yesterday I knew we were having chicken something for dinner… didn't know what. But then your post popped up and that was it! We made it last night and it was so good! The only thing we did differently was to use vidalia onion instead of red onion. We also made Chick-Fil-A's sauce for it. Thanks for the recipe! @Mary Loyal: I made this with bacon tonight and it was delicious! Thanks for the idea. 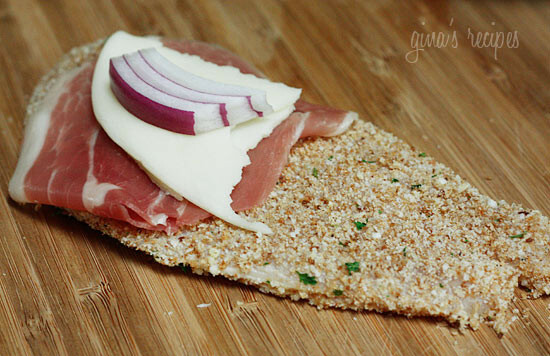 I never have prosciutto on hand and I really wanted to make this dish when I saw the recipe. I just made this for dinner. Soooooo yummy!!! I couldn't find reduced fat provolone, so I used some light mozzarella. It was amazing. I think the provolone would be even better, if that is possible! Thanks for another wonderful recipe! I am so glad I found your site. You are a life saver!!!! I had the deli counter slice me some fontina cheese – thinly. It was absolutely wonderful too. Did you actually mean ground black pepper instead of fresh pepper? I see ground pepper on the picture I think….And if I am wrong, did you then mince fresh pepper really small ? THANKS !! Looks fantastic! I just made this and…oh my god it's amazing! So I know this may kill the nutrition facts posted above, but do you think you would use bacon into of prosciutto? I have an open pack in the fridge I am dying to get rid of. Could I make this on Sunday and cook for Monday dinner? Or would it be best to assemble and cook right away? Veal! Why didn't I think of that? I have never made veal, defintely going to give it a try. THANKS! Oh gosh, I love when the cheese comes melting out! Could you also use Swiss? Pork would probably be good, or maybe even veal cutlets! You're going to love this! I plan on making many variations in the future! Just came across your website last week and I am in lurve! So my hubs is allergic to chicken. Do you think this would work (and still be tasty) with a thin piece of pork? 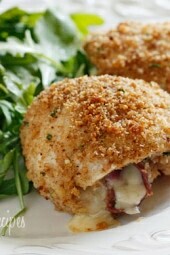 I have made pork cordon bleu for years and it is great! I use a slice of pork loin and beat it until it is nice and thin. No I believe points remain the same. If I used regular italian seasoned breadcrumbs instead of whole wheat will it change the amount of WW points?